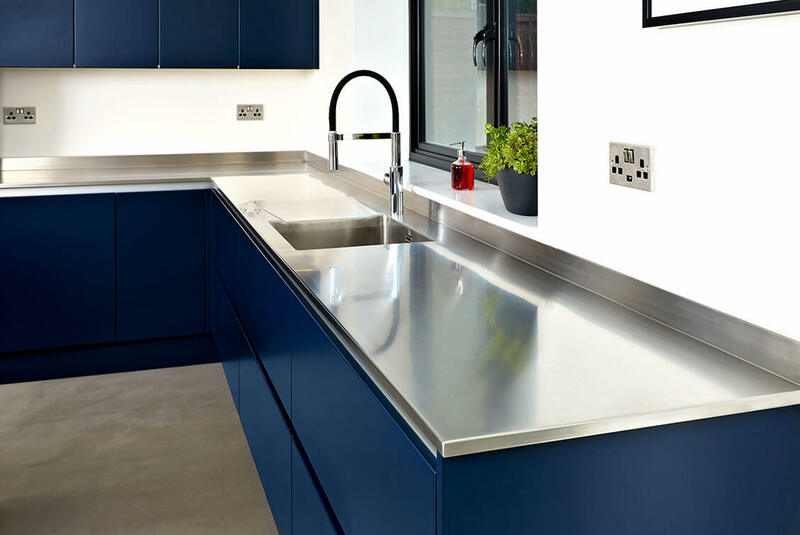 Each of our stainless steel kitchens is fully bespoke: from freestanding storage units to wall cupboards, shelving and under-sink cabinets, plus fully-integrated stainless steel kitchen worktops, sinks and hand-wash basins, our range is as versatile and practical as your requirements. 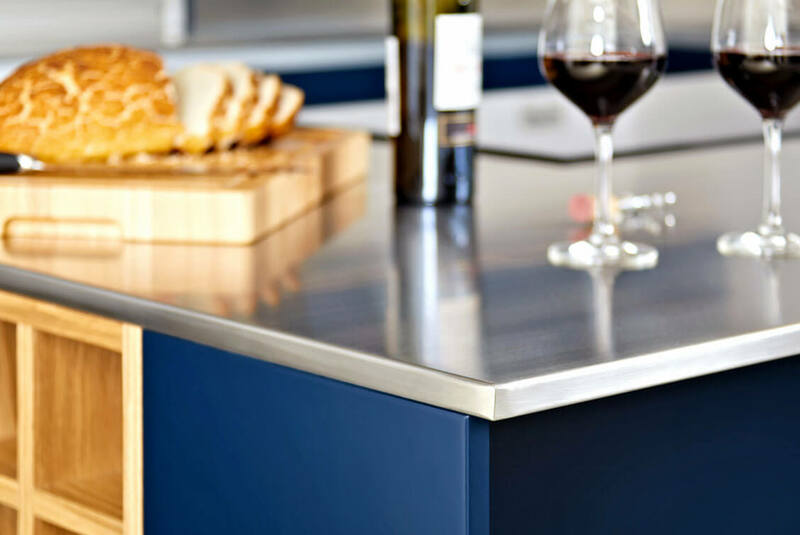 Fabricated in our Nottingham factory from premium steel that will last for decades, every item in our bespoke stainless steel kitchens can be tailored to your designs. Our product is also the most environmentally-friendly option on the market: we use a raw sheet comprised of around 60 per cent recycled materials, and the end product is fully recyclable. The sheer durability of our creations means they are the financially-viable solution for your educational, catering or home environment. Only stainless steel will stand up to the daily damage and high temperatures of an academic, domestic or commercial kitchen. Where ceramic sinks will crack and stain over time, our steel units will need only a regular wipe to maintain their premium shine. 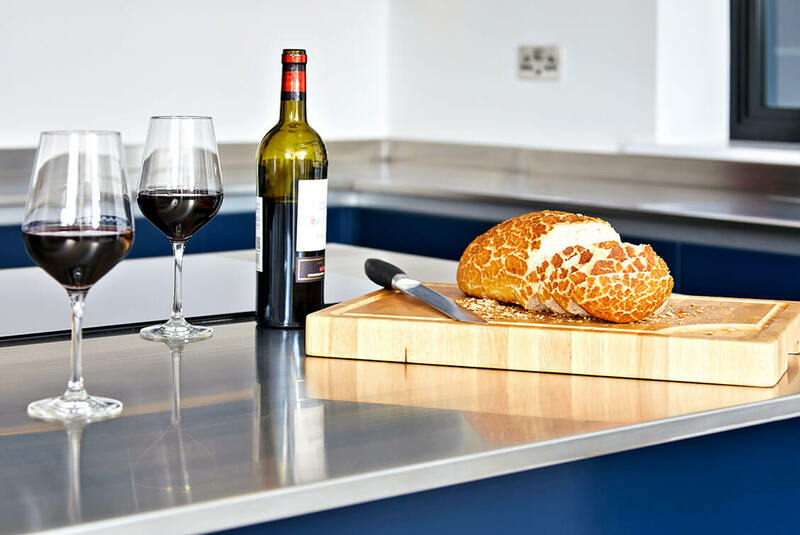 Our steel worktops are more durable than composite. They are also more resistant to the high temperatures of dishes placed straight from the oven than the most costly stone products, such as granite, which will mark over time. 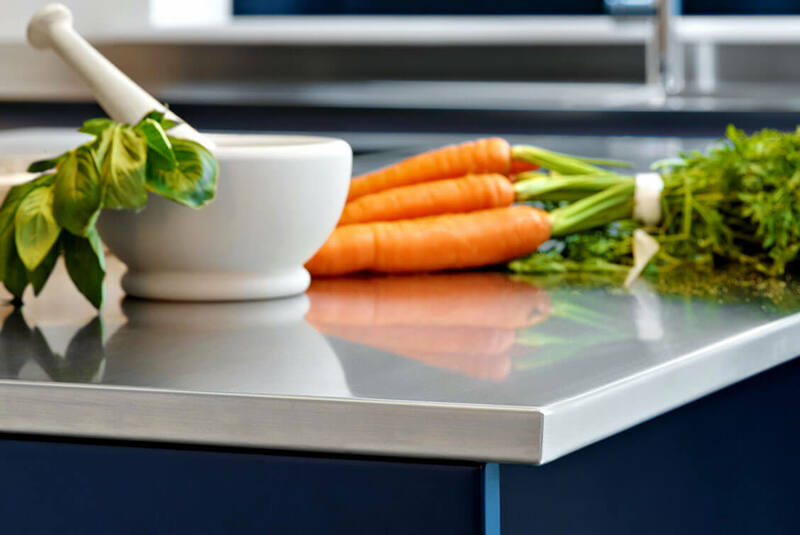 The steel used in our stunning, tailor-made stainless steel kitchens boasts naturally-occurring antibacterial properties, which are enhanced by the fact that every part of the kitchen is fully welded, for a seamless finish. This leaves no cracks or joins in which bacteria can breed or crumbs can gather – making our stainless-steel kitchens the most hygienic choice available. 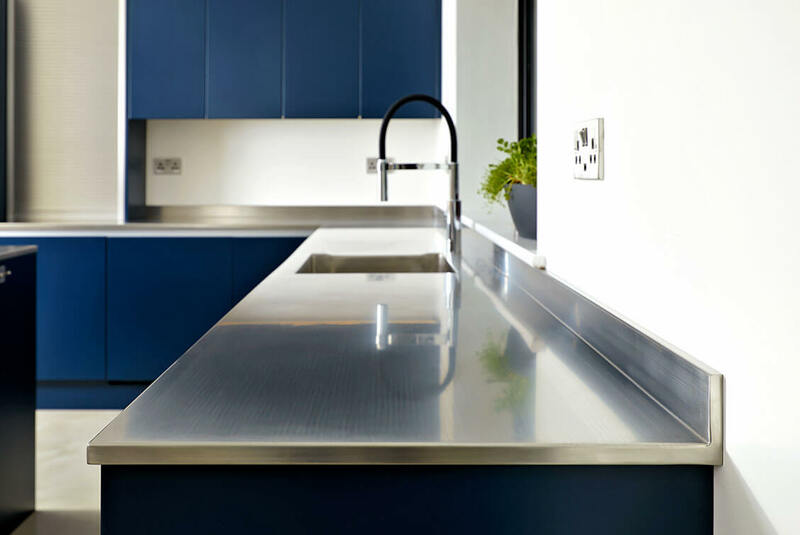 Our ability to fabricate seamless stainless steel countertops to a custom specification means that were able to accommodate your needs and use the space you have effectively. Simply click on the relevant section below to find out more about our kitchens for your academic, commercial or domestic needs. Whether you are sourcing a kitchen for a preschool, college or other academic facilities, you need a high-quality product that will last for decades. Our stainless-steel kitchens are fabricated entirely to your specifications, from a premium-quality metal whose longevity will outlast all other materials on the market. 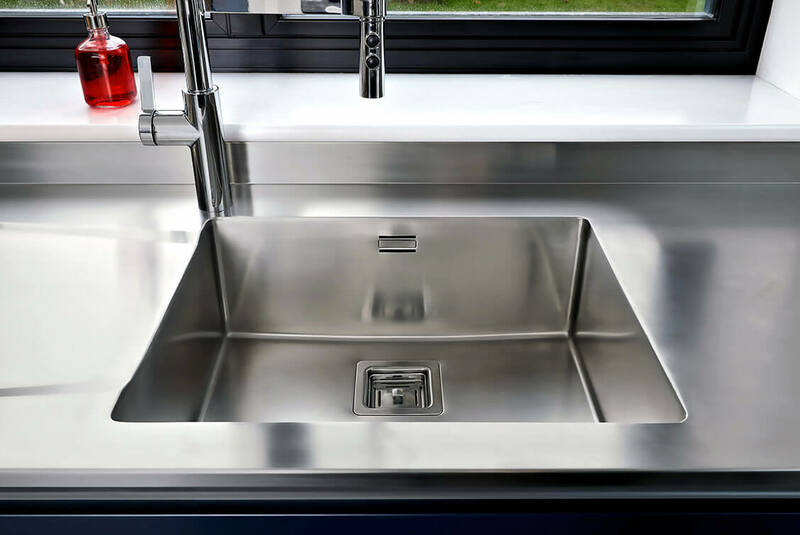 Our steel sinks and basins are tougher – and more stain-resistant – than their ceramic counterparts, while our worktops will far outlast composite counters. It is this supreme durability that makes our kitchens the economically-sound choice for your project. In any academic facility, it is vital that hygiene is optimal, to protect the cooks and the students. We use only high-quality, 304 food-grade steel for our kitchens. This metal conforms to all current Health & Safety and Food Hygiene regulations and features an integral antibacterial agent that outstrips all other materials for hygiene control. By ordering an entire kitchen from stainless steel, you ensure fully-welded joins with no visible seams in which germs and food crumbs can gather. This results in a fully-wipe-clean surface, which is easy to maintain and will long retain its sheen. Being fully bespoke, our kitchens can be fabricated to fit the exact space you have available. From worktops with rounded edges to lockable drawers for safeguarding sharp implements, we can supply the exact products you require, to your specifications. Call or email us today, to discuss your project. Stainless steel has long been prized in the catering arena, for its robustness, high hygiene properties, ease of maintenance and sheer longevity. Our 304 food-grade steel conforms to all current Food Hygiene and Health & Safety regulations and is the toughest product on the market. 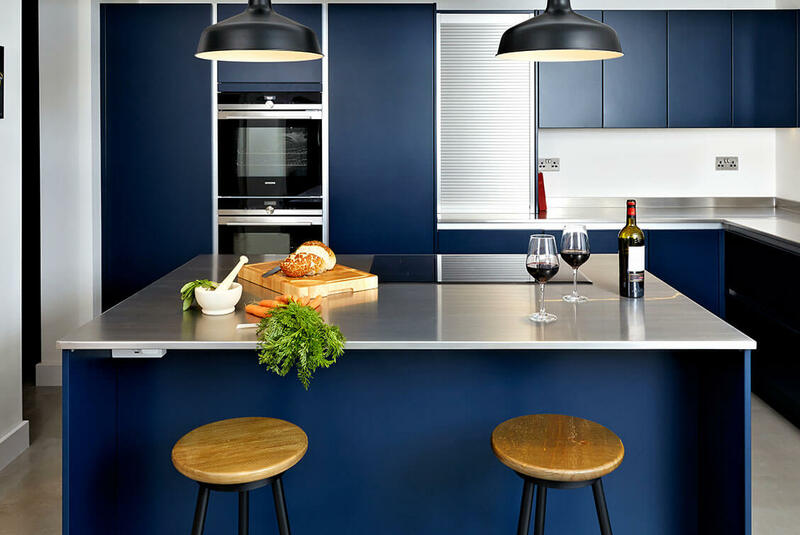 Our kitchens will stand up to the rigorous demands of a busy commercial kitchen – from heat-resistant worktops to impact-resistant sinks and cupboard doors. Each one of our stainless-steel kitchens is fully bespoke, made in our Nottingham factory by skilled engineers. This flexible approach allows us to supply the exact product you need to furnish your catering space. We can provide any combination of worktops, shelving, cupboards, sink units, hand-wash basins and plinths, in any configuration. From bench tops with rounded corners (to avoid collision hazards) to fully curved worktops as a space-saving or aesthetic choice, and from mobile preparation tables with lockable castors to fixed, open shelving or lockable drawer units – whatever your requirements, we can fabricate the product. We can also supply from a wide range of prefabricated sinks and hand-wash basins – or even fabricate a premium sink or basin to your specifications if space is tight or your requirements more specialised. From a larger bowl to a specific tap siting, the bespoke option allows for full customisation. At DSM, we pride ourselves on our reliability: we always supply to our deadline, so you can be sure your project will be completed within the allocated timeframe. A stainless-steel kitchen is the ultimate in cutting-edge chic. The gleaming surfaces and streamlined units provide a highly-reflective finish that will retain its contemporary feel for decades to come. All of our luxury stainless-steel kitchens are fabricated by skilled engineers in our Nottingham factory, lending us the versatility to provide the kitchen of your dreams. Every element can be adapted to your designs – from curved worktops to movable tables and storage units (with lockable castors), and from rows of open shelves to banks of enclosed cupboards and drawer units. Every join in our kitchens is fully welded, achieving a seamless finish that avoids those annoying cracks in which crumbs so often accumulate. What’s more, the food-grade metal is of such high quality that it meets all current Food Hygiene and Health & Safety regulations and is impervious to extremes of heat. 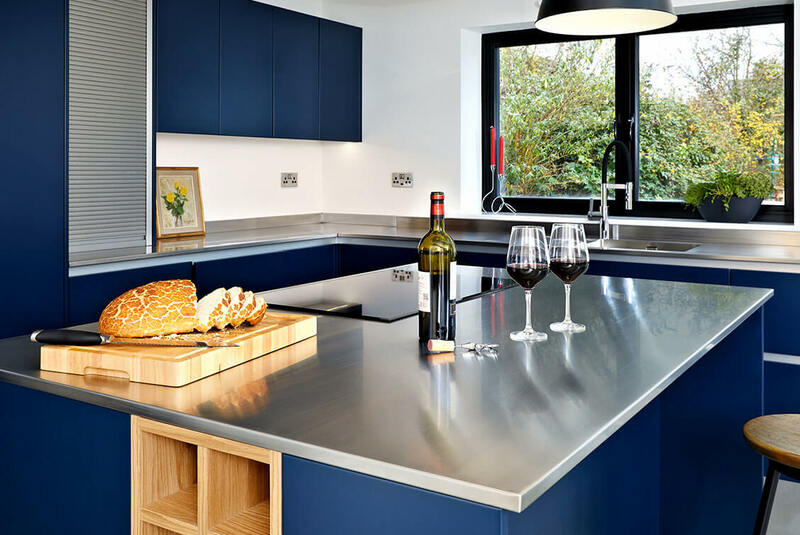 Even a granite worktop will eventually mark from dishes continually placed straight on to it from the oven – a stainless steel work surface will remain unblemished. As well as its heat-resistance, durability, high hygiene properties and robustness, our steel is also the most environmentally-friendly option on the market: made from raw sheets that comprise around 60 per cent recycled materials, the end product is also fully recyclable. Take a look at the wide choice of products we offer for your kitchen, including a variety of different sinks and hand-wash basins, plus a choice of handle for cupboards and drawers. Worktops can be made to any length and combined with any configuration of units. We have such faith in our product, that our domestic kitchens come complete with a twenty-five-year guarantee*, for your peace of mind. Simply contact us today to tell us what you need, and we will fabricate the perfect kitchen for your lifestyle.